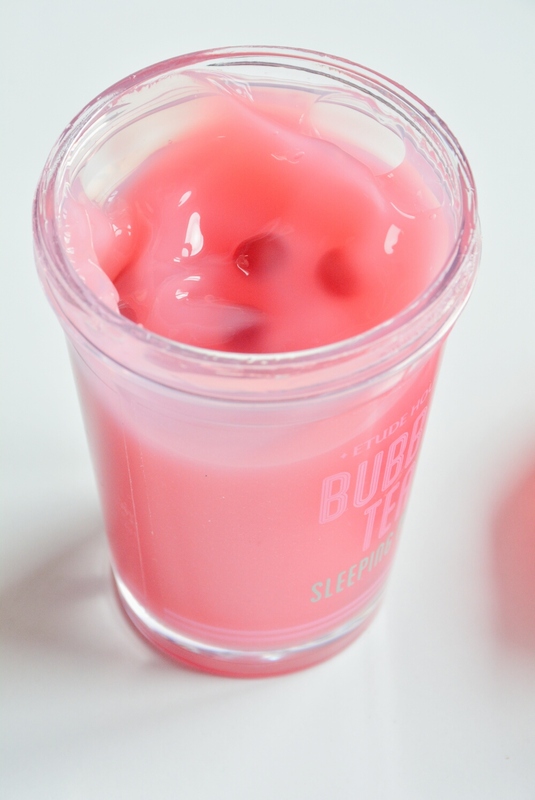 If you are a sucker for cute packaging and if you are all into K-beauty, then, you need to try this Etude House Strawberry Bubble Tea sleeping pack, if you haven't yet. I feel really bad sometimes, because it's not that easy to get Korean brands in Slovenia, but on the other side, I love ordering online, even though I have to wait for a month or more, for package to come. This sleeping pack was one of my first Korean and also one of my first sleeping products so I can't really compare it to some other related beauty products. I can say that this was a really impulsive purchase, because I was just scrolling through eBay and found those adorable packagings. I wasn't really familiar with all those Korean beauty brands and I just gave it a try. When I received this sleeping pack I made a huge research and now I always know what certain products do for your skin, which Korean brands exist, which products are worth the hype and which aren't. Also - when ordering online, always check out the seller and make sure it is from Korea. If you are familiar with Jolse webshop - you can find same products here - it's official Jolse seller on eBay. Before you order, always check the prices both on eBay and on Jolse, because they aren't always the same. I find eBay easier to use, because I always have some problems at their webshop (logging out, forgetting password etc.). As I mentioned before, that was a really impulsive purchase and I'm a big big sucker for cute pink kawaii things. 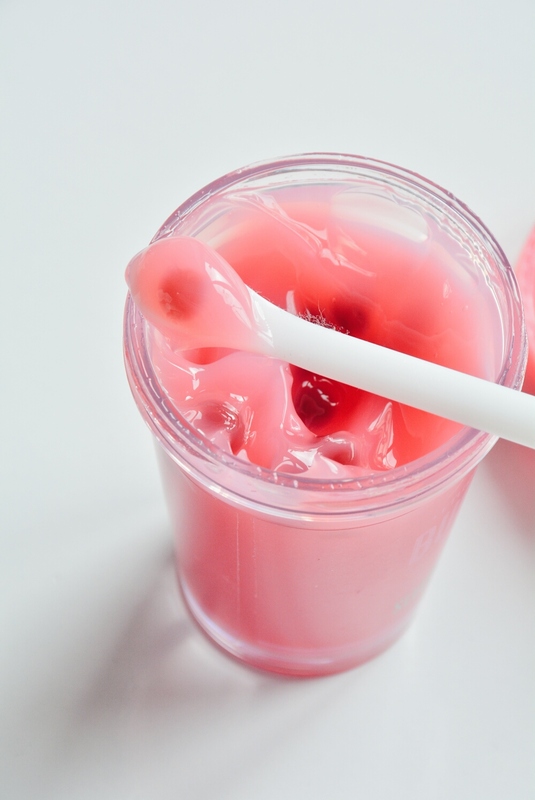 It really looks like real pink bubble tea. I tried bubble tea once and I didn't like it - it was too sweet for me, but hey, it looks awesome! You also get a long white spatula along with your sleeping pack, which is perfect, because it scoops just a right amount of the product, so you can cover your entire face. The container is made of some harder plastic, so there's no feat that you would spill the product all over the place. 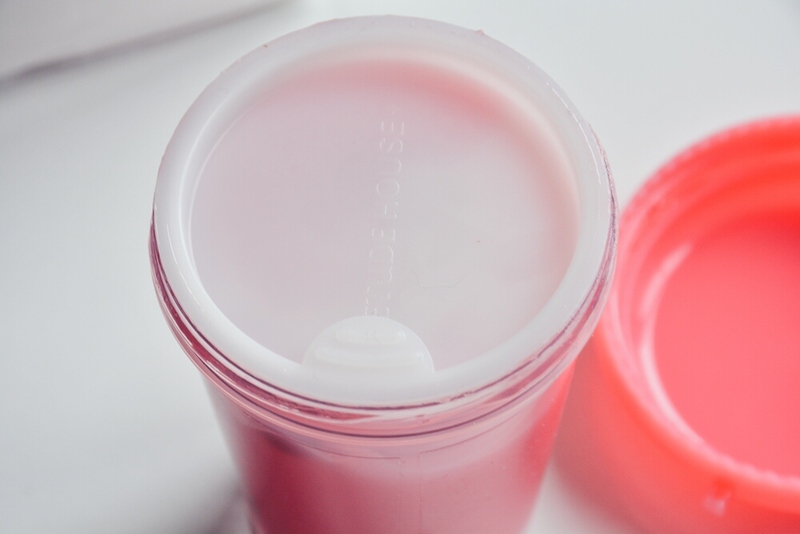 Also, there's a protective layer of plastic on a container (with Etude House logo on it) - and that's really useful for a person as clumsy as me. 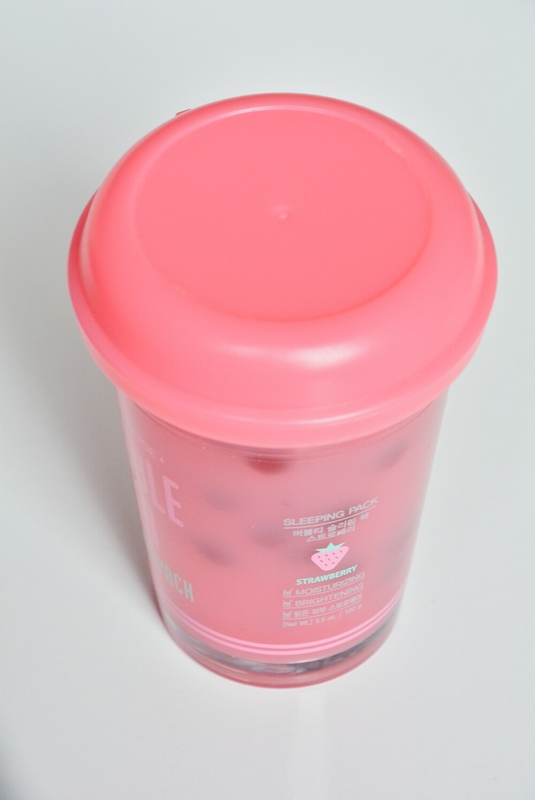 How to use Etude House Bubble Tea Sleeping Pack? It's made from gel and from little gelish bubbles. I always take the spatula and fill it with gel and with one gelish bubble. 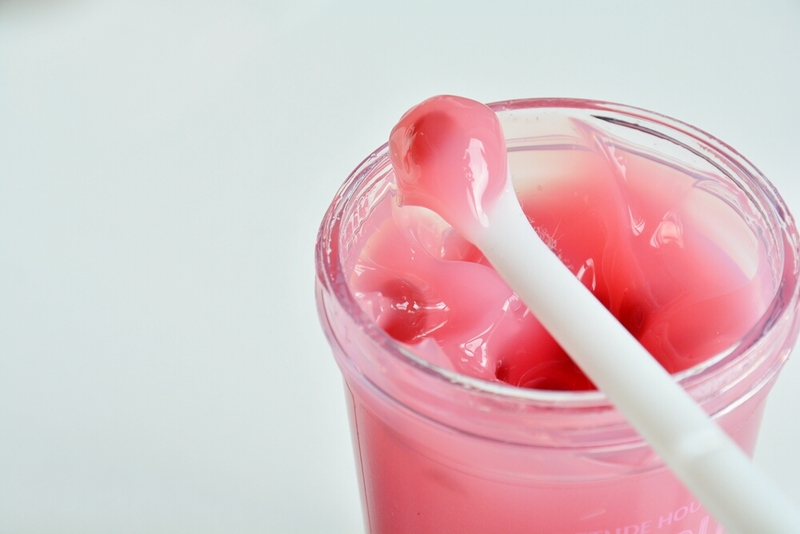 You need to press this little bubble so it breaks down, and then just mix it with the remaining gel. It should cover your entire face! 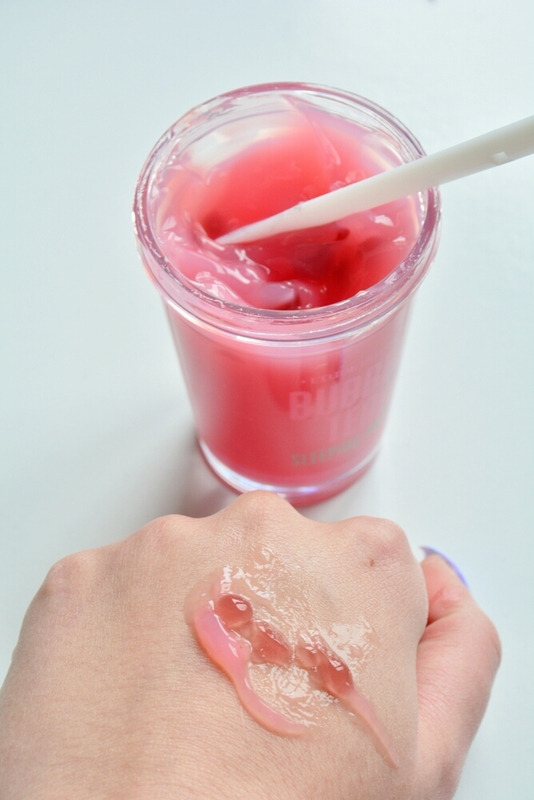 You should expect that this gel will transfer into a moisturizing film, so you can't really use it troughout the day, unless you stay at home. I use it once a week, when I'm really stressed and I need some cuteness and moisture in my life. My expectations for this sleeping pack were really low, because I wasn't familiar with K-Beauty, but all I can say now is: I LOVE IT. It is really moisturising and gives my skin a special glow. I didn't have any skin breakouts after using it and it has deffinitely made a good impression on me. The only disadvantage I can think of is that it could contain more gelish bubbles. Will sure tell you, how much product there will be left, when I will use all of the bubbles. The smell is sweet, it does smell like strawberries and It's not disturbing when you wear it on your face. You can get it for aprocimately 10 USD, which is not that expensive, since you can use it for months. Oh, I almost forgot - there are 3 different flavors: Strawberry, The Black Tea and The Green Tea. 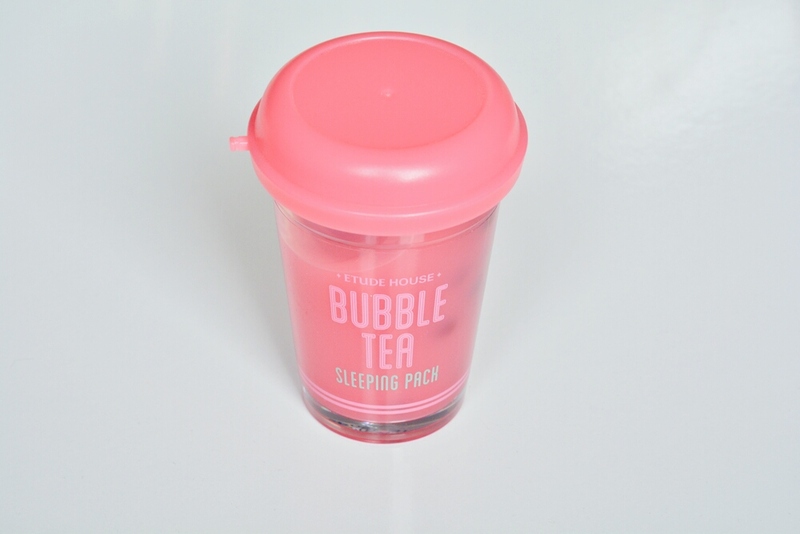 I'd love to hear your experiences with Etude House Bubble Tea Sleeping Packs & please tell me, which one of those three do you prefer?